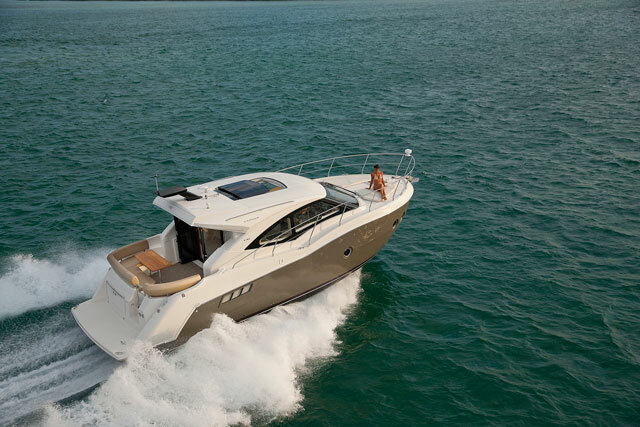 The new Carver C37 Coupe is a roomy pocket yacht that’s ready for adventure. 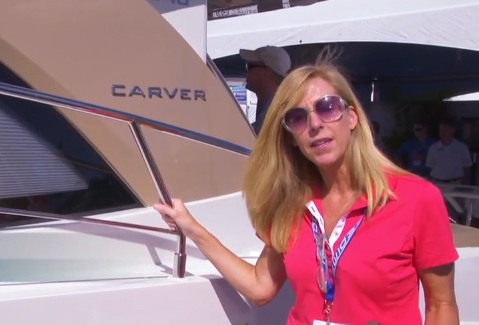 Carver has been on a roll lately, introducing new boats like the C34 Command Bridge, and the C40. Now they've bridged the gap between the two, with the C37. The Carver C37 Coupe is a yacht that turns heads whether alongside the dock or carving a wake. It exudes the flair of a European yacht, with a unique bow entry that smoothly flows aft, accentuated by large windows, while the two-tone livery gives it a "coachwork" appearance more commonly associated with the elegant, hand-crafted limousines of the 1920s. If the Carver C34 is too small and the C40 is too big, the C37 may prove perfect. 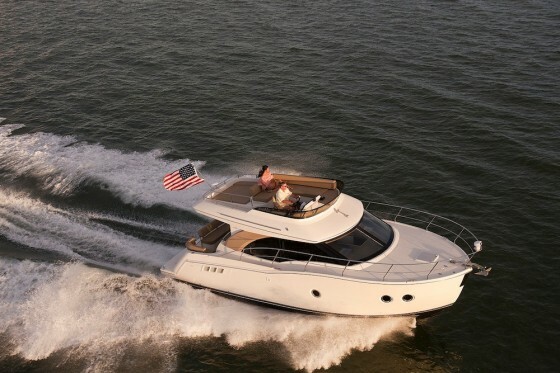 Powered by twin 320 HP Mercruiser 377 Magnum Bravo Three SeaCore stern drive gasoline engines, the C37 topped out at 40.2 mph at wide open throttle while consuming 51.7 GPH. Throttling back to 4000 rpm achieved a brisk 29.8 MPH while reducing fuel consumption to 29.45 GPH. Motoring along at a leisurely 9.4 MPH at 2000 rpm, the C37 sipped a frugal 8.5 GPH—leaving plenty of the fuel budget available for drinks and hors d'ouvres to be served aboard during cocktail hour cruises. Those who prefer diesel will be very happy with the twin Volvo D4 Duo Prop 300 HP stern drive option. Once you’ve reached your destination, you’ll find that the oversized, non-slip swim platform provides plenty of room for dangling toes in the water while at anchor, with easy access a few steps up to the cockpit where the L-shaped lounge and teak dining table await. The roofline extends aft to provide protection against the sun while retaining an open-air atmosphere. Floor-to ceiling glass doors provide a view of the salon inside, and can be opened to combine the two areas into one oversized social and dining section. The open layout flows seamlessly to the guest seating/lounge/dining area, which features U-shaped dinette with ample room for a dozen or so guests. 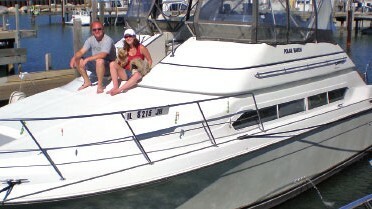 Opposite is the galley, equipped with stainless-steel appliances and solid-surface countertops. 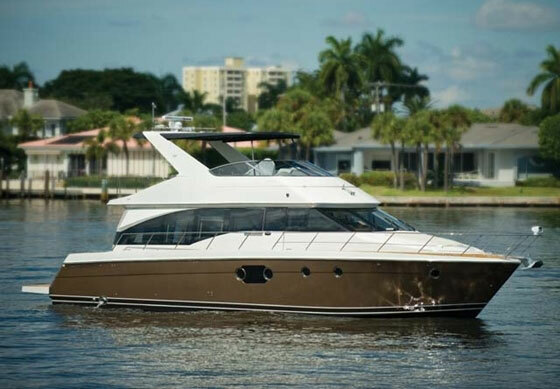 The oversized windows and fully-opening doors bring the outside in to make the salon and the aft cockpit one huge comfort zone, adding to the feeling that this yacht is a cocoon of comfort on the open water. Overhead, yet more breezes enter the C37 Coupe via a sunroof that slides back. Down below, the midships guest stateroom features an impressive 6' 5" of headroom and a 12" opening port with a screen to bring in sunlight—or moonlight—for an airy atmosphere that invites sleeping in late. 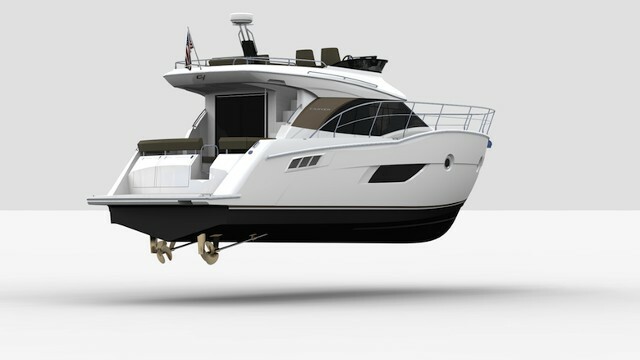 Twin berths quickly convert to a queen, while the hanging locker accommodates your guest’s belongings. The C37 can also accomodate additional guests in the salon, where the dinette converts into a double berth. The master stateroom, set all the way forward for maximum privacy, is dominated by the oversized island berth. 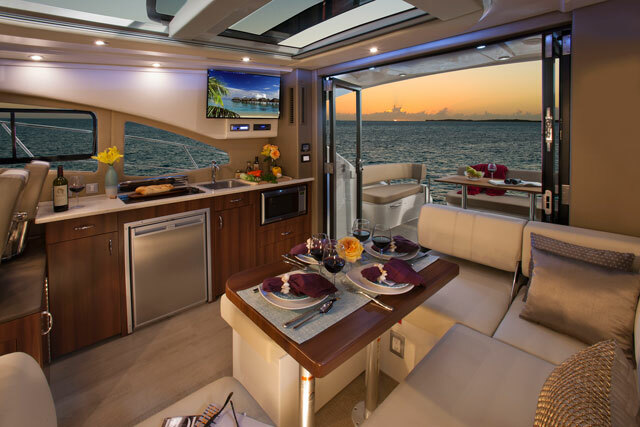 Look past it, and you’ll discover lush wall coverings, an expansive overhead translucent deck hatch that provides natural illumination during daylight hours, twin hanging lockers, and an expanse of shelves to hold all the clothing and personal effects needed for an extended cruise. 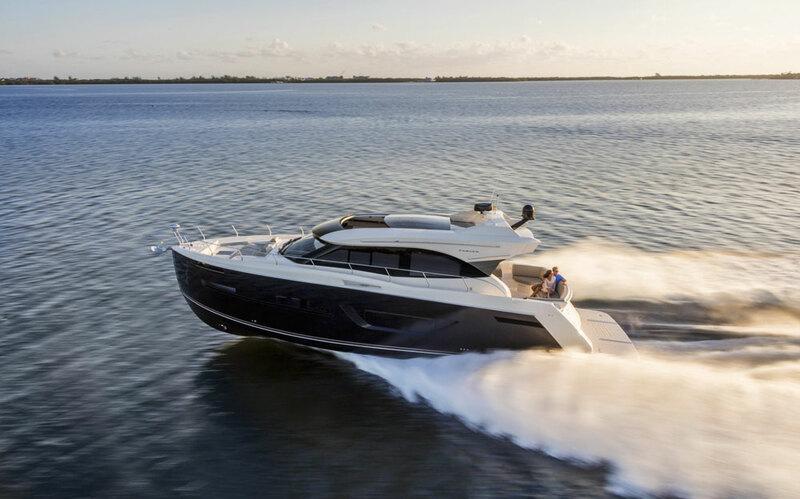 We’ve seen Carver plying new waters with innovative models and new hulls for the past few years, and the C37 Coupe is a welcome continuation of this trend. Overall, it’s ideal for island-hopping, coastal cruising, or daytrip adventures—with all the flair of European yet classic styling. Other Choices: Those looking for a slightly smaller comparison to the C37 may want to see the Regal 35 Sport Coupe. If you want to go larger, check out the Tiara Coronet 3900. 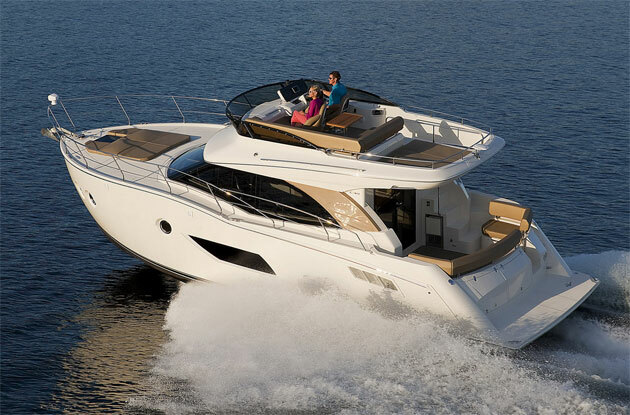 And for a real change of pace, consider the outboard-powered Sea Ray 370 Venture or the Pursuit SC 365i. For more information, visit Carver.